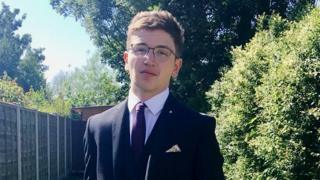 Yousef Ghaleb Makki was found in Gorse Bank Road in the suburb of Hale Barns, near Altrincham, at about 18:40 GMT on Saturday. The teenager, from Burnage in south Manchester, was taken to hospital where he died. Two boys, also aged 17, have been arrested on suspicion of murder and remain in custody for questioning. Officers have appealed for witness to come forward. Det Supt Phil Reade, of Greater Manchester Police, said: "This is an incredibly tragic case which has seen a teenage boy sadly lose his life. "Yousef's family has understandably been left devastated by his death and the thoughts of the entire investigation team remain with them at this difficult time." He said detectives had been "working throughout the night and into today" to establish what had happened. Officers were remaining "open minded" about the motive of the stabbing, he added. Mr Reade urged anyone who had been walking or driving near to Gorse Bank Road or Sunbank Lane at about 18:30 GMT to get in touch. Yousef's death comes a day after a 17-year-old girl, Jodie Chesney, was killed in a knife attack in a London park. Home Secretary Sajid Javid said on Twitter he would meet police chiefs following the series of stabbings around the country "to stop this senseless violence".